Portable power perfected, the Springfield Armory XD(M) 10mm could be viewed as the ideal single all-around utility handgun — according to Contributing Editor Will Dabbs, MD. In the June issue of GUNS Magazine, Dabbs delivers a solid case for considering the mighty do-all 10mm. Citing the XD(M)’s striker-fired trigger as “superlative,” grip safety as “magnificent” and magazines as “the best in the business,” Will’s test gun ran perfectly and smoothly, shooting straight and comfortably. “Recreational range toy, home-protecting howitzer, truck gun or serious hunting implement, the Springfield Armory XD(M) 10mm could potentially be all things to all shooters,” he suggests. Is fluted ammo great — or a gimmick? Handgun instructor David Freeman explains how they put a different spin on defensive bullets — testing loads from Inceptor, NovX, Black Hills and Underwood. “I shot well over 2,000 rounds and had only one fluke (or maybe a ‘fluted fluke’). Ultimately, this is ammunition you can count on for larger-caliber effectiveness while treating your hands to ‘smaller-caliber’ recoil,” he contends. Safe, simple to use and affordable, an SCCY CPX-3 .380 Auto is up for grabs in this month’s Firearms Package Giveaway. Featuring 10-round capacity and Roebuck Quad-Lock technology to ensure accuracy and smooth operation, the CPX-3 sports a double-action trigger and eye-appealing design. June’s winner will also receive an ARX/RNP Sport & Carry combo pack in .380 Auto (125 cartridges total) from Inceptor and a Phrike knife from Spartan Blades. 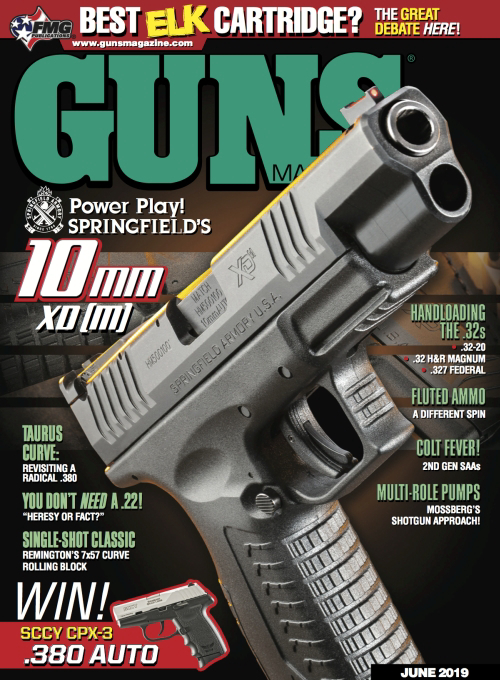 With a combined value of $618, readers are encouraged to enter the free drawing by visiting www.gunsmagazine.com/giveaways. There’s plenty more in June GUNS … As controversial a topic as religion or politics, Wayne Van Zwoll wades into the waters of many an elk hunter’s debate in “Best Elk Cartridge?” “Rifle Gear 101” supplies all the essentials for beginners in the Rifles column while the Shotguns installment details why Mossberg’s pump-gun packages offer a mixed-bag of hunting muscle — and more bang for your buck, too. In the “good old days” milsurp classics like the Remington Model No. 5 Rolling Block rifle could be had for fire-sale prices, from which at least one invaluable lesson was learned as told in this month’s Surplus, Classic & Tactical Firearms. Think Tank’s “Guns Of The Guides” shares what one Alaskan pro carries on the job — and at home — to keep the bears at bay.